When we forked those Pitchfork grays. To find gray in a cowboy’s string. Of their stud, Joe Bailey’s King. Not a job he could not do. On the gray horse I called Blue. To be part of the Pitchfork crew. That you quit and hang your spurs. Sure deserved to work no more. And came up to the big barn door. On that cold and bitter day. When I lost my Pitchfork gray. Darrell Arnold has been writing poetry for more than forty years. He was an associate editor at Western Horseman magazine for five years, then launched his own publication, Cowboy Magazine, which ran for nearly eighteen years. Poetry, primarily cowboy poetry, was an integral part of both publications. In the early ‘90s, Darrell started turning his poetry into songs and has now had 19 poems recorded by various western singers. In 2001, he wrote the lyrics for “Sing One for the Cowboy,” which won the Western Music Association's “Song of the Year" award. In 2018, he wrote the lyrics for “Pitchfork Grays,” which was named “Best Western Song” by the prestigious Western Writers of America. 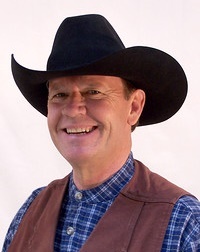 Darrell continues to write poetry and has extended an open invitation to cowboy singers everywhere to team up with him to make more memorable songs. What fun! Reminds me of the song written up Wildrose Canyon in the Panamnts. The composer wrote over 50 songs, but only one made the big time. "Ghost Riders in the Sky.." Congratulations. Thanks for this delightful post. A good piece of work that brings me a smile. I love cowboy poetry. I could relate because I grew up near Billings, Montana and my father was a rodeo cowboy who led the parades on his white horse named Zephyr and my grandfather owned the rodeo grounds. I love those internal rhymes! Problems usually get solved, one way or another, in these cowboy ditties. These words plant a picture in my mind.